For the past three years, leveraging the emerging markets has been my primary investment theme. Initially, my thesis was simply to “buy what China wants.” Eventually, it expanded to include the BRIC economies (Brazil, Russia, India and China) as well. About 3 months ago, I did some rudimentary research on china railroads. My conclusions were – it is a must own sector, but implementation is difficult for U.S. based investors. I often say that knowledge is not power, but acting on knowledge is power. It is interesting to know that Beijing is spending $190 billion on its railroad build-out through 2010, but profiting on that knowledge is much more meaningful. To date I have leveraged the China theme by buying global companies that supply to China. It is the old pick and shovel play. During a gold rush a few miners get rich, but many of the suppliers of mining equipment get rich. Extrapolating that to China's massive industrialization would imply investing in companies that supply items such as raw materials and machinery to China. Take a look at any Copper mining company's chart and you will understand what I am saying. Since this indirect approach has worked so well, ideally I would like to extend it to the railroad build-out. However, that has proved to be a challenge. Bombardier Transportation (Canada), Mitsui (Japan), Kawasaki Heavy Industries (Japan), Alstom Transportation (France) and Siemens (Germany) are the largest rail equipment companies. General Electrical is also a significant player. All are conglomerates with exception of Bombardier and only GE and Siemens trade on U.S. Stock exchanges. Kawasaki Heavy Industries trades on the pink sheets. 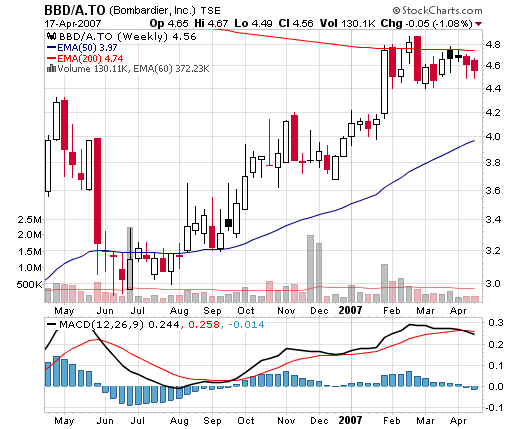 Since trading Canadian stocks is fairly easy for US investors, Bombardier would be an interesting choice. However, I would prefer a basket approach (multiple stocks) as opposed to hitching my wagon to one star. Bombardier has performed fairly well since the middle of last year. However, with such limited selections; the indirect approach doesn't appear to be viable. Our other option would be directly investing in a Chinese railway company. There is currently only one Chinese railway company that trades in the U.S. – Guangshen Railway Company (GSH). All in all, there appears to be limited options for U.S. based traders to leverage the Chinese railroad build-out. In my previous life, I sold software to high tech companies. Back in the late nineties, many of the up and coming internet companies were our clients. After many of those meetings, our first call was often to our stock brokers. Sometimes we made as much by trading their stock as the sale. I remember one company that had some very hot technology, but I didn't make the call after the meeting. The company made a wireless email device. It was ideal for anyone who spent much time out of the office. Who wouldn't want one? This company was sitting on a gold mine. However, after the meeting I simply drove to the next appointment without calling my broker. I wasn't comfortable buying a stock on the Canadian stock exchange. That company was Research in Motion, the maker of the Blackberry. Back then their stock was trading for short money. I don't want to know what it is trading for today. I say all that to say, sometimes we have to go to the opportunities to profit. The China Railroad theme may require direct investment in Hong Kong.